currently under construction at Hughes Landing Boulevard, The Woodlands. The development is scheduled for completion in 2020. Hughes Landing on Lake Woodlands has a total of 386 units. Located on 200-acre Lake Woodlands, the luxury apartments will feature one, two and three bedroom options. Upscale finishes include quartz countertops, simulated wood flooring, stainless appliances, walk-in closets, 10-foot ceilings and washer and dryers in every home. All units will feature the “Dwello Home Automation Technology”, which allows the tenant to control the door lock, thermostat and lights via smartphone or verbally through Amazon’s voice-controlled, Alexa. 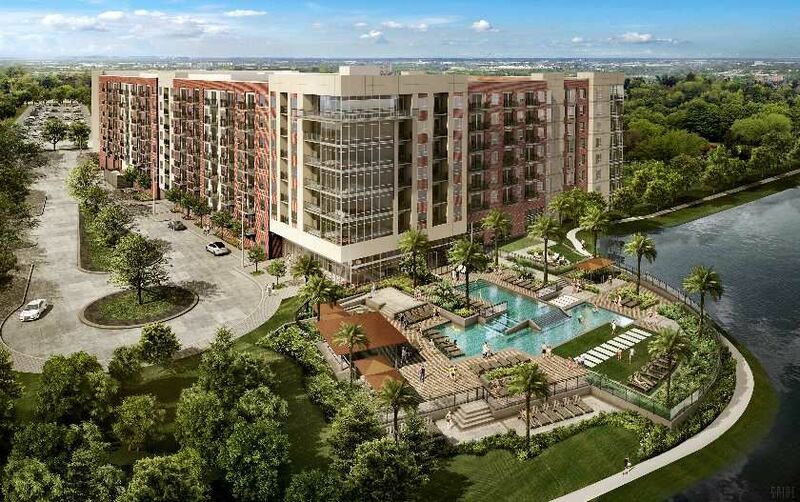 Amenities in the new development include a resort-style pool and outdoor entertainment area, overlooking Lake Woodlands. A sky lounge on the top floor will offer expansive views of the lake and serve as an extended living room and a social gathering place. Wine storage will also be available. Health and wellness is a major component of this project, providing an expansive fitness center with state-of-the-art equipment, a large yoga room, spilling out to an outdoor fitness lawn. In addition, the property will provide multiple kayaks and bikes free to use by residents. Your inquiry will be delivered to the developer / builder of Hughes Landing on Lake Woodlands, who will send you more information about this development.